Chainsulting smart contract audit’s team was asked to audit the contracts for the FINOM NOM & FIN Token contracts. We looked at the code and now publish our results and findings. The audited code is located in the Ethereum Blockchain as Smart Contracts. The audit makes no statements or warrantees about utility of the code, safety of the code, suitability of the business model, regulatory regime for the business model, or any other statements about fitness of the contracts to purpose, or their bug free status. The audit documentation is for discussion purposes only. 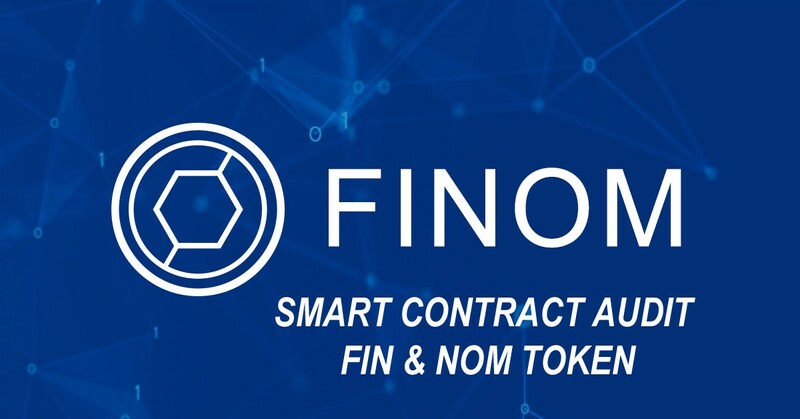 Finom is a Blockchain company founded after the merger of market leaders — trading app TabTrader, mining multipool Nanopool, exchange Cryptonit — along with mining farm Cryptal and brokerage app Beetle.io. Finom is building the genetic code of the future economic and financial system. Guided by the principles of transparency and security, they create one universal and low cost tool for an easy management and access to finance. They use Blockchain technology to create trustworthy and convenient financial services. That allow users all over the world to become more independent, to improve their material prosperity and to be sure of safety of their investments. A majority of the code was standard and copied from widely-used and reviewed contracts and as a result, a lot of the code was reviewed before. It correctly implemented widely-used and reviewed contracts for safe mathematical operations. The audit identified no major security vulnerabilities, at the moment of audit.